Samsung has already ruled the mobile world by standing tall in front of Apple in terms of specs and quality of services. The latest “gaga” in the tech world has been created by the latest launch of Samsung Galaxy S5, making it hard for others to match the standards which Samsung has tried to set by the launch of this device. Samsung has always been on the heavier side in terms of specifications and features; Samsung Galaxy S5 is no exception with its 5.10 inch display which is both water and dust resistant. The resolution stands at 1080 x 1920 pixels and the device is powered by 1.9GHz processor along with 2GB of RAM. The device is equipped by a 16 megapixels rear camera and a 2.1 megapixel front camera. These are some of the features of the packed Galaxy series devices. Let us try to get some of the unorthodox features and techs which this dynamite offers. In addition to a network support of 4G carrier, it has a MIMO support which means that two Wi-Fi connections can be connected at once to gather a great internet speed with both the antennas which this device is equipped with. Secondly, it has an Ultra Power Saving Mode which saves the battery consumption by turning the screen colors into white and black and shutting down the unwanted apps in the mobile phone when the battery is about to drain full. It doesn’t give a chance to turn it down, once you put your eye on it but sadly it is very costly. It is priced at over 50k INR, which is a huge amount keeping in mind that iPhone 6 is on the verge of its launch! 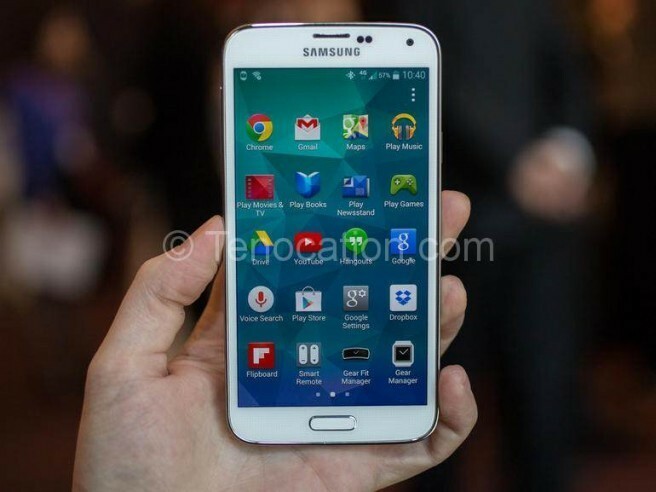 Technocrats have described this device as an extension of S4 rather than a “Go Gear” type of device. It is not a next generation phone; all it has done is that is has made the flow a little smoother. So far it has been rated on the highest side from most of the reviewers but cluttered interface and Heart Beat monitor failure adds to the negatives. But if you are ready to spend this much of money on this device, don’t think twice as it’s not just a device but a true companion. Good battery life, fantastic camera, innovation in software features and it’s capability to add Samsung Gear accessories make it a hot pick. Samsung has given its users two color variants namely black and white.